I have more Pretty Jelly goodies to share with you on this Friday. This collection consists of three colors to celebrate Pretty Jelly's third anniversary. One of the best new trends in indie polish that I'm head over heels about this year are multi-chrome flakies, rainbow flakies, and metallic flakies. I'm a blingy girl, and these flakies take bling to the extreme. 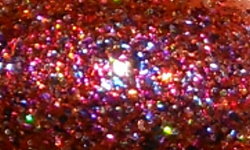 These three anniversary shades all have rainbow flakies in them and are blingtastic to the max! pink/purple. Note: My camera really picks up on the pinky/purple flash on this, but in real life this does have an overall golden look to it as you can see on the sides of my nails. 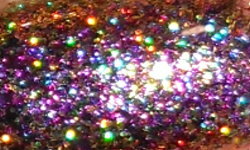 Celestial is an opaque silver holo glitter with rainbow flakies. Colors: These are all three absolute stunners. I love all the shades and they all offer something different. Celestial is cool toned, Amore is warm toned, and Transcendent Triennium kind of falls in between. You're getting different tones in all of these and the color shifts and flashes from these flakies are incredible! Formula: Excellent opaque glitter formulas. I used 3 coats on all three and got full opacity. I think some of you could get away with 2. These glitters cover the nail easily and evenly. Price: This is going to be releases as a set on on Monday 10/26. You can buy the set for $32.40 (10% off) between 10/26-11/2. These will be available for individual purchase on Pretty Jelly's anniversary 11/10 for $12 each. You can purchase these from Pretty Jelly's etsy site. Overall: These are incredible glitter/flakie combination colors. I love the depth and complexity each of these shades have. Again, another thoughtful collection from Pretty Jelly. 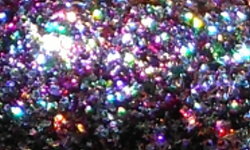 If you love glitter and flakies you will not be disappointed by these shades. They're a must have in my book!